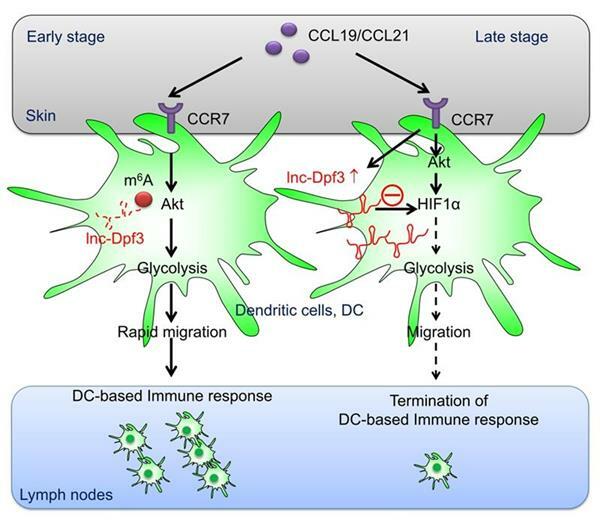 In the latest issue of Immunity, Prof. Xuetao Cao’s group reports that feedback of a long non-coding RNA lnc-Dpf3 restrains CCR7-mediated dendritic cell (DC) migration via directly inhibiting HIF-1α -dependent glycolysis. CCR7 chemokine receptor stimulation induces rapid but transient DC migration toward draining lymph nodes, which is critical for the initiation of protective immunity and maintenance of immune homeostasis. The mechanisms for terminating CCR7-mediated DC migration remain incompletely understood. In this study, Liu et al identiﬁed a long non-coding RNA lnc-Dpf3 whose feedback restrained CCR7-mediated DC migration. CCR7 stimulation upregulated lnc-Dpf3 via removing N6-methyladenosine (m6A) modiﬁcation to prevent RNA degradation. DC-speciﬁc lnc-Dpf3 deﬁciency increased CCR7-mediated DC migration, leading to exaggerated adaptive immune responses and inﬂammatory injuries. Mechanistically, CCR7 stimulation activated the HIF-1α transcription factor pathway in DCs, leading to metabolic reprogramming toward glycolysis for DC migration. lnc-Dpf3 directly bound to HIF-1α and suppressed HIF-1α-dependent transcription of the glycolytic gene Ldha, thus inhibiting DC glycolytic metabolism and migratory capacity. This study sheds additional light on the molecular mechanisms for timely termination of DC migration and prevention of harmful inﬂammatory immune response and provides additional insights into the crosstalk between epigenetic and metabolic pathways in feedback-control DC migration and inﬂammatory responses.